But where will the 580 pound statues go? 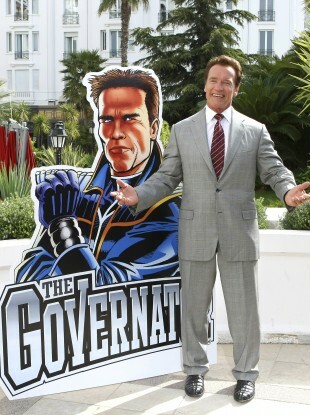 Schwarzenegger unveiling a new international television series, The Governator, at Cannes in April. NOT CONTENT WITH one former politician and movie star Arnold Schwarzenegger is reported to have commissioned THREE statues of himself during his leaner, meaner bodybuilding days. The Telegraph reports that the 64-year-old former governor of California has ordered three bronze statues of himself that will be eight foot high and weigh 580 pounds each. One will go to the recently opened Schwarzenegger museum in his childhood home of Thal in Austria whilst another will go to Columbus in the state of Ohio where something called the annual Arnold Fitness Weekend is being held. And as for the last one? He definitely wants “one for himself,” Tim Parks, the owner of TW Bronze which has been commissioned to pour the metal for the statues, told the New York Daily News. The statues will cost roughly $100,000 (€73,000) and depict Schwarzenegger in his younger days flexing in a classic body-builder pose that flaunts his biceps, abs and quads. Email “Arnold Schwarzenegger commissions three statues of himself ”. Feedback on “Arnold Schwarzenegger commissions three statues of himself ”.